★ LOOGAROO ★: MILKY IS FAMOUS! Atta boy Milky, yer ugly mug right on the front page of yesterday's Telegraph Journal! Good on ya! I love how they continue to use your nickname instead of your real name. Hilarious! The Fatkat way is infectious! Sorry to comment block your post Justin, EVERYONE LOOK DOWN AT RIDICULOUS GANGSTA PICS! Michael Frenette is a kid at heart. At 23, he still hasn’t given up on his lifelong love for comic books, action figures and cartoons. And so it’s only fitting that the Westville native pursued a career in animation. As head animator for a new computer animated TV show called Supernormal, a super hero show that will debut in England sometime next year, he now gets paid to be a big kid. Frenette works at FatKat Animation Studios in Miramichi, which is the animation studio behind Supernormal. 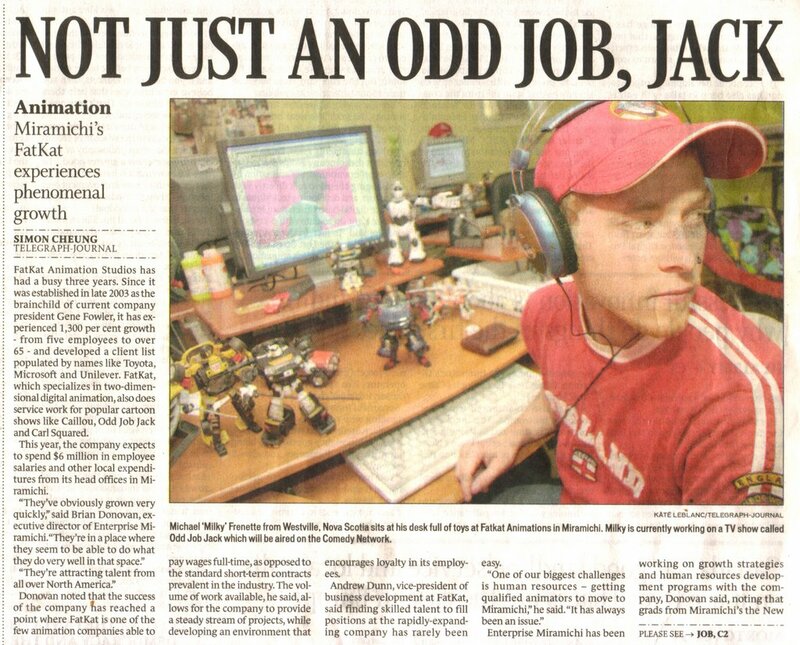 It’s a dream job for Frenette, who says he has over 1,000 Transformer figurines crowded on shelves in his bedroom. “This is what I’ve always wanted to do. I can’t imagine doing anything else,” he said in an interview recently. Frenette is vague on the details, but he did reveal that he and a team of about 20 staff members are currently animating 52 episodes of Supernormal, a children’s show. They create about two eleven-minute shows a week, which is standard in the painstakingly long process of computer animation. Frenette describes the animation style for the show as “Warner Brothers-like,” meaning the animation runs at a quick, and somewhat frantic, pace. He has plenty of responsibilities as head animator, but he isn’t complaining. After all, he said he likes to have creative control. Frenette graduated from the digital animation program at Nova Scotia Community College In Truro in 2004. He briefly worked at Wetsand Animation in Dartmouth where he was an animator for Carl Squared, a cartoon show on Teletoon. Eventually, he transferred to FatKat in search of bigger projects and more creative freedom. At such a young age, he has already achieved great success. But for now, he’s looking forward to the challenges he’ll face while working on his latest project. FatKat Animation Studio specializes in two-dimensional digital animation, and animators have contributed to popular cartoon show like Caillou, Carl Squared and Odd Job Jack. The studio has seen tremendous growth since it was established in 2003, while high-profile companies like Toyota and Microsoft are among the list of clients.